The infrared iris hypothesis has not withstood the test of time. All subsequent research has found that if the iris effect even exists, it is much smaller than originally hypothesized, and may even amplify global warming rather than reducing it. "Much like the iris in a human eye contracts to allow less light to pass through the pupil in a brightly lit environment, Lindzen suggests that the area covered by high cirrus clouds contracts to allow more heat to escape into outer space from a very warm environment." Lindzen et al. was published over a decade ago, so how has the iris hypothesis withstood the test of time? "We argue that the water vapor feedback is overestimated in Lindzen et al. (2001) by at least 60%, and that the high cloud feedback should be small. Although not mentioned by Lindzen et al, tropical low clouds make a significant contribution to their negative feedback, which is also overestimated. Using more realistic parameters in the model of Lindzen et al., we obtain a feedback factor in the range of −0.15 to −0.51, compared to their larger negative feedback factor of −0.45 to −1.03 [W m-2 K-1]." A few months later, Lin et al. (2002) published another study examining the iris hypothesis. Lin et al. took observational data from the Clouds and the Earth's Radiant Energy System (CERES) over the tropical oceans and plugged them into the same model that Lindzen used. This observational data dramatically changed the iris hypothesis, because it showed that the clouds in the tropics are significantly more reflective (a.k.a. higher albedo) and have a weaker warming effect than in the Lindzen model. Clouds have two competing effects on global temperature - cooling by reflecting solar radiation, and warming by increasing the greenhouse effect. Which of these effects is larger depends on the type of cloud. The model used by Lindzen et al. had concluded that for clouds in the tropics, the warming effect was greater. 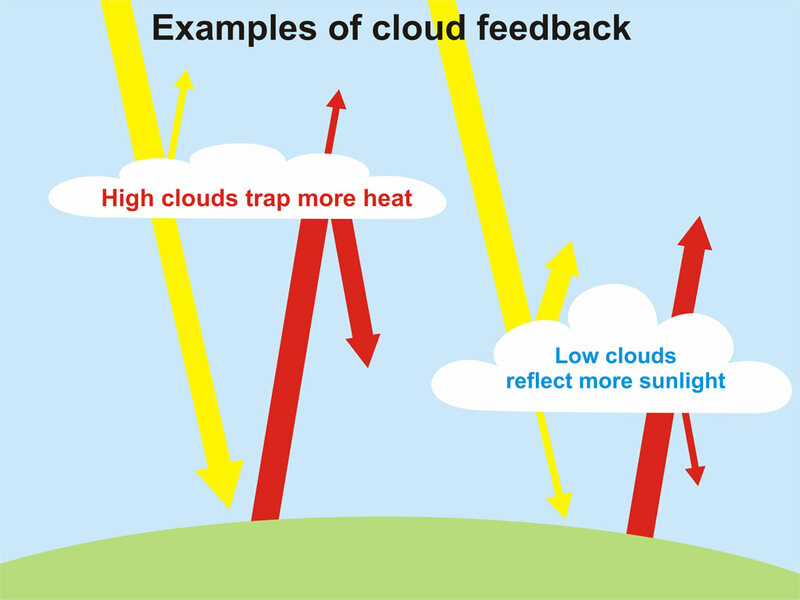 Thus the decrease in cloudcover hypothetically caused by the iris effect would result in less cloud warming, and thus a negative feedback. "The observations show that the clouds have much higher albedos and moderately larger longwave fluxes than those assumed by Lindzen et al. As a result, decreases in these clouds would cause a significant but weak positive feedback to the climate system, instead of providing a strong negative feedback." "It is unreasonable to interpret these changes as evidence that deep tropical convective anvils contract in response to SST increases. Moreover, the nature of the cloudweighted SST statistic is such that any variation in cloud fraction over the coldest water must produce a negative correlation with cloud fraction, a fact that has no useful interpretation in climate sensitivity analysis. Therefore, the observational analysis in [Lindzen et al.] lends no support to the hypothesis that increased SST decreases the area covered by tropical anvil cloud." "A clustering algorithm is used to define the radiative, hydrological, and microphysical properties of precipitating convective events in the equatorial region observed by the Tropical Rainfall Measuring Mission (TRMM) satellite....The adaptive iris hypothesis (clouds thinning with warming) is clearly not supported by the TRMM data. TRMM storms become larger and cover a greater fractional area, and the largest of them become somewhat brighter, at higher SST. Several flaws in reasoning lead Lindzen et al. (2001) to their conclusion." So within a year of the publication of Lindzen et al., there was one paper concluding they had significantly overestimated the iris effect, a second concluding that if the iris effect existed, it would lead to increased warming, and a third and fourth papers finding no evidence for the iris effect. Like Lin et al., Chambers et al. (2002) examined data from CERES to look for evidence of the iris effect. As with previous results, they found that the feedback effect is much smaller than proposed in Lindzen et al., and probably slightly positive. "Regardless of definition, the radiative properties are found to be different from those assigned in the original Iris hypothesis. As a result, the strength of the feedback effect is reduced by a factor of 10 or more. Contrary to the initial Iris hypothesis, most of the definitions tested in this paper result in a small positive feedback. Thus, the existence of an effective infrared iris to counter greenhouse warming is not supported by the CERES data." Lin et al. (2004) compared Earth Radiation Budget Satellite (ERBS) decadal observational data with the predictions of the iris hypothesis using 3.5-box model, also replacing the modeled radiative properties in Lindzen's paper with CERES data, as Lin et al. (2002) had previously done. The study concluded as follows. "On the decadal time scale, the predicted tropical mean radiative flux anomalies are generally significantly different from those of the ERBS measurements, suggesting that the decadal ERBS nonscanner radiative energy budget measurements do not support the strong negative feedback of the Iris effect. Poor agreements between the satellite data and model predictions even when the tropical radiative properties from CERES observations (LaRC parameters) are used imply that besides the Iris-modeled tropical radiative properties, the unrealistic variations of tropical high cloud generated from the detrainment of deep convection with SST assumed by the Iris hypothesis are likely to be another major factor for causing the deviation between the predictions and observations." "this study addresses some of the criticisms of the Lindzen et al. study by eliminating their more controversial method of relating bulk changes of cloud amount and SST across a large domain in the Tropics. The current analysis does not show any significant SST dependence of the ratio of cloud area to surface rainfall for deep convection in the tropical western and central Pacific....the interaction between the SST and effective cloud size may even have a slight positive relationship, not the inverse relationship suggested by [Lindzen et al.]" "The decrease in ice cloud coverage is conceptually consistent with the ‘‘infrared iris’’ hypothesized by Lindzen et al. ....We caution, though, that the ice cloud reduction with tropospheric warming reported here is on a time scale of weeks; it is not obvious whether similar behavior would occur on the longer time scales associated with global warming." However, Dessler (2010) did not find evidence of a significant negative cloud feedback, as was suggested by Spencer et al. (2007). "There have been inferences of a large negative cloud feedback in response to short-term climate variations that can substantially cancel the other feedbacks operating in our climate system. This would require the cloud feedback to be in the range of –1.0 to –1.5 W/m2/K or larger, and I see no evidence to support such a large negative cloud feedback"
Dessler concluded that the short-term global cloudcover feedback is probably positive, and unlikely to be strongly negative, with a 95% confidence range at 0.54 ± 0.74 W m-2 K-1. Therefore, even if the iris effect exists in the tropics, it won't be able to offset very much (if any) global warming, according to Dessler's results. In short, much research has focused on Lindzen's iris hypothesis, but very little supporting evidence has been uncovered. On the contrary, studies have consistenly shown that Lindzen dramatically overestimated the iris effect in his initial study, and that if the effect exists, it may even amplify warming as opposed to dampening it. There certainly isn't any evidence that the infrared iris will result in enough of a negative feedback to significantly slow down global warming.